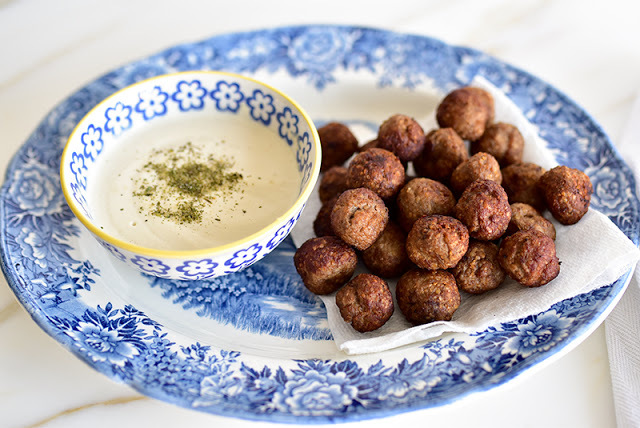 Fried kibbeh bites are so delicious that we make them not just with leftover kibbeh, but with kibbeh made just for this purpose. They are excellent pan fried. Can you bake them? Sure. Remember that kibbeh has no fat in it, so if you bake them, it’s best to brush them with oil or butter before and after baking. A half-pound of kibbeh makes about 30 1-inch bites. 1. First, make the dipping sauce so it is ready when the bites are hot out of the pan. In a small food processor, blend the tahini, labneh, garlic, lemon juice, and salt. Add water one tablespoon at a time until the sauce is a thick, dip-able liquid. Taste and adjust seasoning as needed. The sauce can also be whisked by hand. Transfer the sauce in a small serving bowl and dust the top with mint salt. 2. Heat the oil in a nonstick frying pan over medium heat while you shape the kibbeh bites. The oil should register 350 degrees, and can be tested with a small bit of kibbeh; it should bubble up vigorously when it’s added to the oil. 3. Line a sheet pan with paper towel. Start with cold kibbeh straight from the refrigerator (if freshly made rather than leftover, chill for one hour). Shape about a tablespoon of kibbeh into a 1-inch ball, repeating this with all of the kibbeh and placing the balls on the lined sheet pan. 4. Fry the balls in batches, taking care not to crowd them, until they are deep golden brown. Turn them to brown them evenly all over. 5. Use a slotted spoon to remove the bites from the frying pan and transfer to a fresh paper towel-lined sheet pan. 6. Serve the bites hot with the tahini dipping sauce. This is finger-food, or if you prefer, serve them with cocktail toothpicks.